Time to Market, Digital Technology Integration, CX/UX, Operational Agility driven by Digital Transformation (DX). Digital Transformation (DX) is a hot topic — and a big market. 67 percent of technology leaders surveyed by HP Enterprise at Forbes Global 2000 enterprises expected their top initiatives to be related to Digital Transformation. The potential is over $18 trillion of new value to be harvested, according to IDC. Organizations of all sizes must thus rethink their operations and business models in order to deliver an optimum customer experience across all channels, all the while mastering a constant transformational process. The shift toward edge computing, the emergence of the Internet of Things (IoT) and the rapid adoption of Artificial Intelligence (AI) are accelerating the path to ubiquitous Information Technology. As a technology vendor, we have embraced this paradigm shift and embarked upon a constant transformational process. Our goal is to craft refined and frictionless tools that provide the most direct path from ideation to actual implementation, and ultimately to help organizations master complexity with simplicity. Like us, you need to address the challenges of optimizing your internal operations while providing high added-value solutions in a digital age market. 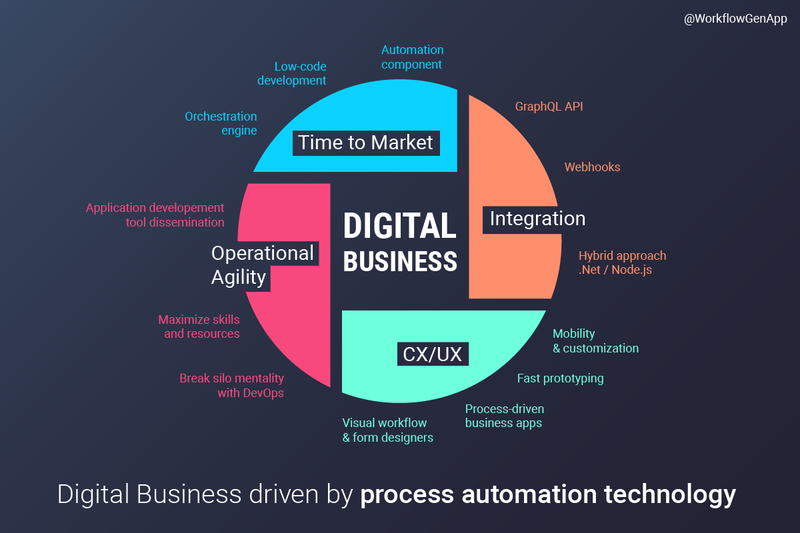 Whether you’re a software vendor, a Value Added Reseller (VAR) or a service provider, here’s how to meet these challenges and grow your digital business using WorkflowGen’s process automation technology. In a rapidly changing business environment with increased competition, you need to accelerate the delivery of solutions to reach your target market at just the right time. Immediately enhance your software or application offerings with a high-performance, battle-tested, competitive process automation component. Seamlessly use WorkflowGen as an orchestration engine for process-driven business applications. Increase your team’s efficiency by leveraging a low-code and highly configurable workflow engine and form designer. In a hyper-connected technological landscape, WorkflowGen enables you to embed solutions using the latest integration technology standards. Whether for a mobile app, a web application or microservices, WorkflowGen’s GraphQL API, webhooks and Node.js integrations provide you with a high level of customization and data manipulation possibilities. With great freedom and speed, you can create original solutions with high added value by going beyond the traditional frameworks of workflows and BPM in general. Our hybrid approach, with Node.js on top of a .NET workflow engine, offers the best of both worlds: fast integration and customization with Node.js, along with high-performance and mature BPM algorithms with .NET. The continuous improvement of customer and user experience is probably the biggest driver of Digital Transformation (DX). Maximize customer engagement and satisfaction by quickly delivering solutions that meet their unique requirements thanks to fast prototyping and low-code approaches. Engage end-users with a comprehensive, mobile-ready and customizable workflow portal. Enable process designers to visually create web forms and business rules without programming. Let developers implement complex integrations and transform web forms into sophisticated business apps in a low-code application development environment. Digital Transformation (DX) is enabled by technology, but is implemented by people. To achieve operational agility, culture, skills and vision all need to evolve at the speed of technological change. Drive internal change with the implementation of new business processes that reflect your target organization. Adapt processes in real time to meet ever-changing business conditions. Break the silo mentality and favor communication between departments by automating transversal business processes that require the collaboration of multiple departments as well as IT professionals. Share application development tools across the organization and empower participants through active roles in process automation using WorkflowGen’s visual process and form designers. Allow your team to focus resources on core value delivery while leveraging WorkflowGen to address your process automation needs.